Baby boys ivory & gold check 4 piece satin suit, perfect outfit for any special occasion including a christening / baptism, wedding, formal occasions etc. Waistcoat: Satin effect waistcoat with an ivory & gold check pattern, fully lined, 3 centre buttons, plain back. Trousers: Pleated ivory satin effect trousers with an elasticated waist for comfort and perfect fitting. Shirt: Long sleeved ivory satin effect shirt, full-length centre buttons, down-collar, perfect compliment to the waistcoat. Tie: Satin effect tie with knot with matching ivory & gold check pattern. Elasticated for the perfect fit, complimenting the suit perfectly. 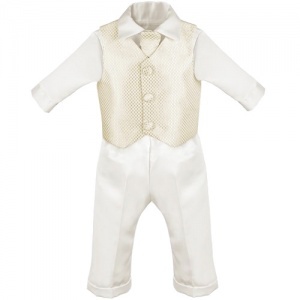 This ivory & gold check satin 4 piece outfit will make your little baby boy look like the perfect handsome gentleman at his christening / baptism, as a pageboy or a guest at a wedding. This was ideal for my son’s christening. Fast & efficient delivery too. Really nice outfit and my son wore it all day without any problems. This company provides a very quick delivery which is an added bonus. Very happy with this website and I have bookmarked it for future purchases. The outfit is amazing and my boy looked so nice in it, plus very fast delivery. Firstly, the delivery on this was so quick! The suit itself was the perfect balence between the traditional christening gown and a modern twist with the waistcoat and tie....everybody complimented the outfit! Absolutely loved this suit and had lots of compliments on the big day! Good quality, true to size, little boy looked really gorgeous in this suit! Also very speedy delivery, excellent customer service!